1927, W Goscombe John RA, Sculptor. Goscombe John had a long association with Llandaff having been a choirboy of the Cathedral in the 1870s. Canon Buckley came to Llandaff in 1878 and served the parish as vicar until his death in 1924. He also served the Cathedral as Canon, the Diocese as Archdeacon of Llandaff (1913-24) and the parish as Chairman of the Parish Council, where he was indefatigable in improving the living conditions of his flock. C20, W Goscombe John RA Sculptor. Bronze standing figure in a clerical dress with papers held in left hand and with right hand resting on a staff. Stepped stone plinth inscribed "A man he was to all the Country dear." 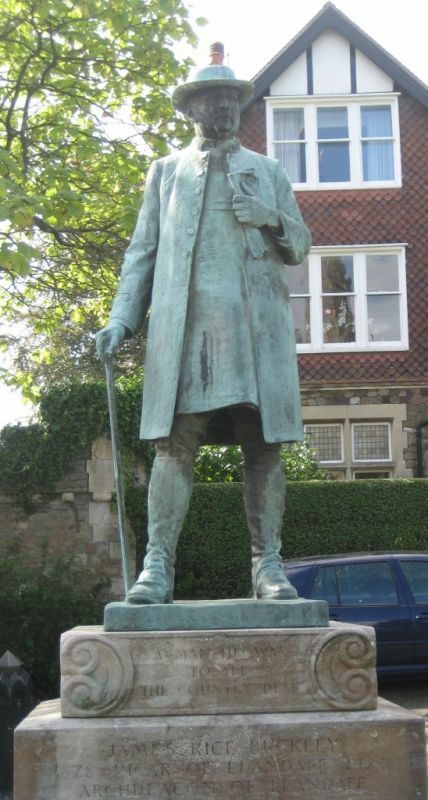 Included as a fine statue by William Goscombe John and for its historic interest as a memorial to James Rice Buckley (1849-1924).